Leadables provides internet marketing consulting and services. to small and medium companies. We specialize in working with small to medium businesses and with hospitality. The people behind Leadables have considerable digital internet marketing experience. We have developed websites and marketing campaigns for SMEs and large enterprises on both the internet and private digital networks. This experience started 35 years ago in the Canadian marketplace and built on further web marketing experience in Europe. Leadables was recently established as an internet marketing consulting firm in North America. In response to the growth in internet data use both in Canada and the US, Leadables provides services and consulting focusing on the use of Marketing Automation, a growing use of platforms and technologies by marketers in all enterprises. We think it is important that all people who market on the web should have equal access to the technologies and services which allow for fairer and, let’s face it, more interesting competition! We understand that as technologies advance in the online marketing sphere, they are not always accessible by smaller enterprises. This happens mainly because a broader grouping of skills and know-how are required and these are costly. But as technology companies decide to fill in the gaps and provide lower cost products and services, SMB’s can begin to make use of these technologies. Our goal is to help small and medium businesses to be more competent and competitive in the online marketing space by adopting these highly valued technologies. 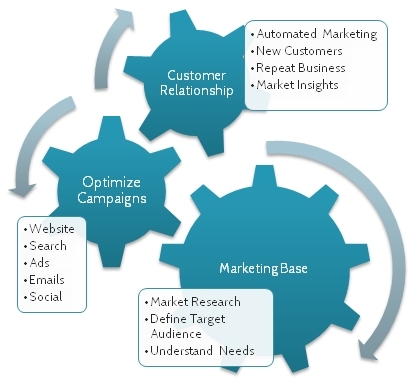 Automated Marketing technologies integrate the various aspects of digital campaigns. Therefore it is important to consider both skills and experience across the gammit of online marketing services from website to email campaigns through to responding to social-driven conversations in the marketplace. Leadables is experienced in all aspects of digital marketing. Our approach is business-based. This means that we develop strategies and tactics which match business goals, ensuring campaigns are responsible to the expectations and outcomes of the business. Twenty-five years ago the Internet existed but it was not yet in the public domain. So large companies with the big bucks were investing in the technologies and online information and marketing sites. They built private networks for vertical markets until the web opened up. They were times of experiment and learning and became the base for what we do today. From news conglomerates to large education institutions, there was a small army of bright, talented people already building our online future. Leadables’ choice of software to effectively serve our customers is a key part of our success. Marketing Automation is a foundation of our business because it allows us to personalize content and campaigns for targeted traffic, work faster and be more efficient. It all adds up to keeping costs down for our customers while doing a bang-up job of marketing for you. Act-On is Leadables’ marketing automation software of choice.